Universal military style holster. For all P-38 and 4" P-08 style pistols, features full-flap cover, extra magazine pouch and heavy duty leather. This holster will also work for a real live fire pistol. This is an exact functional reproduction US M1 cartridge belt. Made from heavy-duty cotton-canvas with ten 3-1/4" x 2" pouches, each with a single-snap flap. Has a metal front fastener and is fully adjustable. Features: Each pouch holds one 8 round M1 clip. High quality top grained leather holster will fit an officer's leather belt or web garrison belt. Features: Length: 14" Weight: 1 lb. 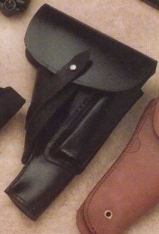 This holster will also work for a real live fire pistol.